Work to halt the erosion of an Iron Age hill fort in Gloucestershire is due to begin soon. 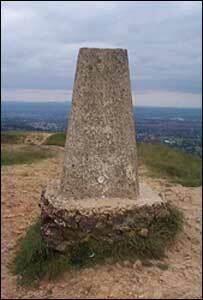 Kimsbury Camp on Painswick Beacon is a popular beauty spot, visited by local people and walkers on the Cotswold Way. The £85,000 facelift will include repairs to erosion scars and ramparts, scrub clearance and the provision of sensitively located information boards. Parts of the site will be fenced off during the work, which is due to be completed by the end of May. County archaeologist Jan Wills said: "It's a nationally important archaeological site. "It's suffered considerable erosion over the years. We are undertaking repair work to protect the site and improve access." The work also involves the construction of retaining structures within the erosion scars, which will be backfilled with limestone rubble. This will be finished with a thin layer of topsoil and the re-establishment of suitable wildflower and grass seeds. Most of the funding for the project has come from the Heritage Lottery Fund and the Gloucestershire Environmental Trust.